Joy has a TS Super Star Regard Heifer calf at side that was born on 8/17/17. Joy measured 58 inches Tip to Tip at 34 months old. 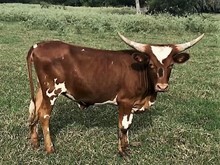 She has very nice Total Horn! Natural Service Jefferson Texa 05/22/2015 02/21/2016 Pasture Bred on 6/3/15 with an expected calving date of 3/12/16.